Does your financial situation cause anxiety and frustration? Are you living paycheck to paycheck? Do you ever forego medication or food in order to pay the rent/mortgage or electric bill? If these statements describe you, you are not alone. I struggle with these same issues. 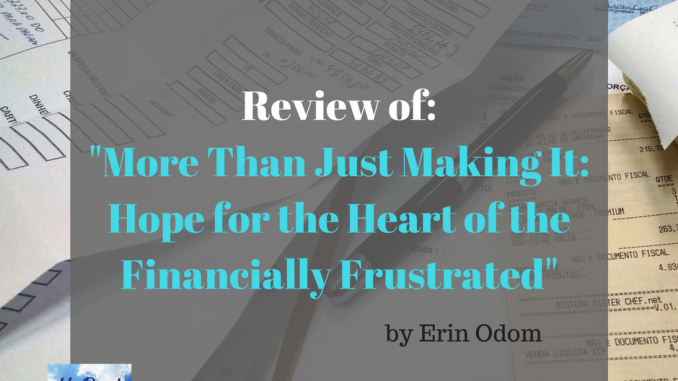 I recently finished reading Erin Odom’s book More Than Just Making It: Hope for the Heart of the Financially Frustrated. Erin experienced poverty, and shares her experiences in this book. Anyone can experience a financial crisis. It does not matter how wealthy you once were, or how educated you are, or how hard you work. Besides not having enough funds to meet basic needs, feelings of shame and guilt can plague the person, causing depression. Erin spends a lot of time discussing these feelings, and the stigma in society of being poor. Her experiences are woven throughout the book. One of the most helpful things I learned, was the importance of figuring out if you “have a spending problem or an income problem”. If you’re being careful with your money, and still run out of money before the end of the month, you have an income problem. If you have a well-paying job, and are struggling to make ends meet, you have a spending problem. Erin then covers ways to save money. She covers how to find savings in food, clothing, furniture, etc. Methods that she actually still uses today to help her family thrive financially. She also discusses the dreaded B word: budget. Erin shows us how to be thankful for what we do have, so that we don’t walk around feeling like we’re in a constant state of lack. She tackles the topic of pride, which makes it hard to ask for help. Erin writes from her Christian faith, which I found very encouraging as I’m in what “feels” like a constant state of lack. On a personal note, I find my faith in God very helpful in this season of my life. I know that He has helped me by providing what I need. We haven’t always had what we wanted to eat, but we’ve had food to eat. I am grateful for family and friends who have also helped out, often without even knowing that it’s needed right then. If you find the Christian faith offensive, I do not recommend this book for you. In conclusion, I think this is a valuable resource for Christians and seekers who are struggling with making ends meet, and all the emotions that go along with that. The strongest plus for me was the attention paid to our beliefs about poverty, and how that affects us when we hit financial hard times. She does an excellent job dispelling the myths surrounding people who need government assistance. My only regret is that there was no mention of the financial difficulties that happen as a result of illness and age. For example, she thinks that if you have an income problem that you need to bring in more income. This is often not possible with chronic illness, especially when a person is not able to work.